Folic acid is a protective B vitamin that, when taken before and during pregnancy, can help protect against neural tube and other defects. Researchers from the University of Granada recently published a study in the journal Appetite revealing three generations worth of folic acid intake data establishing a legacy value for folic acid intake in southern Spain. A Mediterranean diet is packed with natural sources of folic acid, including green leafy vegetables, dried fruits and cereals. Researchers gathered dietary information via questionnaire from three groups of women – adolescent (230), pregnant (296) and menopausal (372). 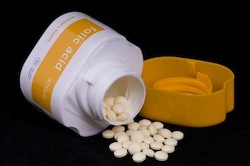 The average daily intake of folic acid averaged 288 µg. The main sources of folic acid were fruit, cereal, pulses, natural juices and vegetables. No outside influences like age, educational level or BMI contributed to the intake of folic acid. Based on these results a Mediterranean diet supplies a higher intake of folic acid from natural sources than most western diets. Source: Monteagudo C, Mariscal-Arcas M, Palacin A, Lopez M, Lorenzo ML, Olea-Serrano F. Estimation of dietary folic acid intake in three generations of females in Southern Spain. Appetite. 2013 Apr 12. pii: S0195-6663(13)00133-5. doi: 10.1016/j.appet.2013.04.004.